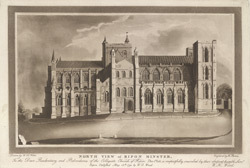 View showing the north transcept of Ripon Minster. The site was originally a monastery established c.660, but a new parish church was built here by the Normans. It was again mostly rebuilt between the mid 12th century and the reign of Henry VIII, becoming a mixture of architectural styles. Daniel Defoe commented that it was a strong, rather plain building with three spires which he described as 'homely ...but not very high or handsome'. By the 18th century, it was reported that 'the church is still standing, tho' the monastery and hospital are suppress'd, and the canons and choir are maintain'd at a much better rate than as above, for they now eat as good beef, and drink as good Yorkshire ale, as their neighbours'.